For all of your other product needs, buy one product and get the second one half price. Buy two products and get the third one FREE! Personal referrals are what we strive for at Gina Mary. Pick up referral cards from your stylist, or just send your friends in. For every referral, you will receive $30.00 off your next service. Friends receive $30.00 off any service also. It's a win for everyone. Compliment your favorite stylist today. What is Eleven Australia?It all Started with Miracle Hair TreatmentELEVEN Australia is the fresh approach to hair and body care. Starting in 2011 with Miracle Hair Treatment, ELEVEN Australia has now grown to a 27 product range for everyone. Australian. Simple. Effective. Ready for your life changer? In just 90 minutes you will love your hair like never before. 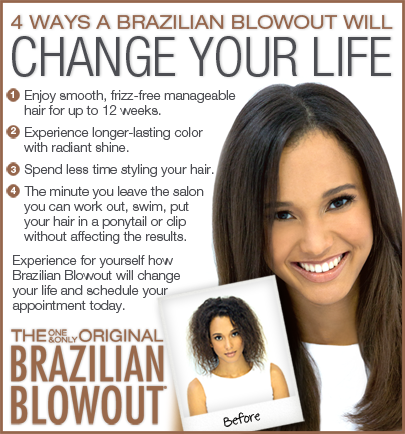 Brazilian Blowout is a perfect way to start the year. Ensuring that your color will last in the hair from the first day to your next appointment.